A high tech rearview mirror released by BlueCell is dubbed BC-F7 Rearview Mirror. You will find 2 microphones, twin speakers, phonebook, voice recording, wireless bluetooth earphone, FM radio and MP3 player. 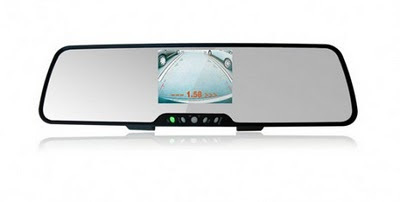 Amazing feature on BlueCell BC-F7 Rearview Mirror is on its wireless parking camera functionality that have to be clipped onto your existing car’s rearview mirror in order to let it function properly. No info on pricing and availability yet.